Home > Shop By Brand > BLACKFIRE Pro Detailers Choice Car Care Products > BLACKFIRE Midnight Sun Ivory Carnauba Paste Wax 7.4 oz. Takes the liquid-like shine of carnauba to new depths! BLACKFIRE Midnight Sun Ivory Carnauba Paste is a hand-poured, premium carnauba wax that combines a mile-deep shimmering gloss with high tech Wet Diamond polymers. It brings out the best in all paint finishes with a combination of super-refined carnauba wax blended with nourishing oils and German polymers. This wax creates incredible depth of shine on all paint colors with a hard, protective barrier to the elements. BLACKFIRE Midnight Sun Ivory Carnauba Paste Wax is perfect on top of BLACKFIRE Paint Sealant or by itself. It glimmers with depth either way! BLACKFIRE Midnight Sun Ivory Carnauba Paste Wax can be used as a final wax or as a topping over any polymer sealant, including the latest generation of super-slippery sealants. It will not haze, streak or cause patches of uneven gloss. It's also extremely resistant to high humidity. BLACKFIRE makes it simple to get the shine you crave! Midnight Sun Ivory Carnauba Paste Wax is a pure wax without any cleaning properties. It is designed to create maximum shine on new, painted metal or painted fiberglass finishes. If your vehicle is two years old or older, we strongly recommend claying the vehicle with BLACKFIRE PolyClay and Clay Lubricant to remove paint contamination. Then polish with BLACKFIRE Paint Cleaner before applying this Wet-Ice over Fire finish. The wax will bond better and have a clearer, crisper shine. BLACKFIRE Midnight Sun Ivory Carnauba Paste Wax is more resistant to washings than a typical carnauba wax. One of the drawbacks of any carnauba wax is durability. Our tests in Florida during the summer have demonstrated water beading after 100 days. The polymers used to fortify Midnight Sun are very resistant to high heat and detergent washings but BLACKFIRE’s Ice over Fire shine was designed for a particular "look," not for ultimate durability. To get the best shine AND durability, use Midnight Sun as a topper over BLACKFIRE Paint Sealant. Between details, spray and wipe the finish with BLACKFIRE Instant Detailer or BLACKFIRE Synthetic Spray Wax to maintain a high gloss and prolong the protection. On a clean vehicle, wipe on a thin coat of Midnight Sun Ivory Carnauba Paste Wax with a foam applicator. There is no need to allow the wax to dry. Wipe off the wax with a soft, clean microfiber towel. BLACKFIRE Midnight Sun Ivory Carnauba Paste Wax can also be applied with a dual action polisher with a soft foam finishing pad. Apply at a low speed and buff off immediately. Blackfire Power Pack - FREE With BLACKFIRE Orders over $50!BLACKFIRE Car Dryer - FREE SHIPPING + FREE GIFTLimited Edition BLACKFIRE Ultimate Complete Bucket KitBLACKFIRE Detailer's BagBLACKFIRE Car Care KitsWet-Ice Over Fire – A Different Kind of ShineBLACKFIRE Garage Banner, 14 x 55 inchesBLACKFIRE Synthetic Clay Mitt Cleaner - Coming Soon!BLACKFIRE Pro Ceramic Coating Wash 32 oz.BLACKFIRE Complete Coating Maintenance KitBLACKFIRE Compound 8 oz.BLACKFIRE Polish 8 oz.BLACKFIRE Paint Sealant 32 oz.BLACKFIRE BlackICE Hybrid Montan Sealant WaxBLACKFIRE BlackICE Hybrid Montan Sealant Wax 3 oz.BLACKFIRE Car Wash 32 oz.BLACKFIRE Wash & Wax 32 oz.BLACKFIRE Foam Soap 32 oz.BLACKFIRE Foam Booster 16 oz.BLACKFIRE Midnight Sun Ivory Carnauba Paste Wax 3 oz. Applies and buffs off effortlessly! 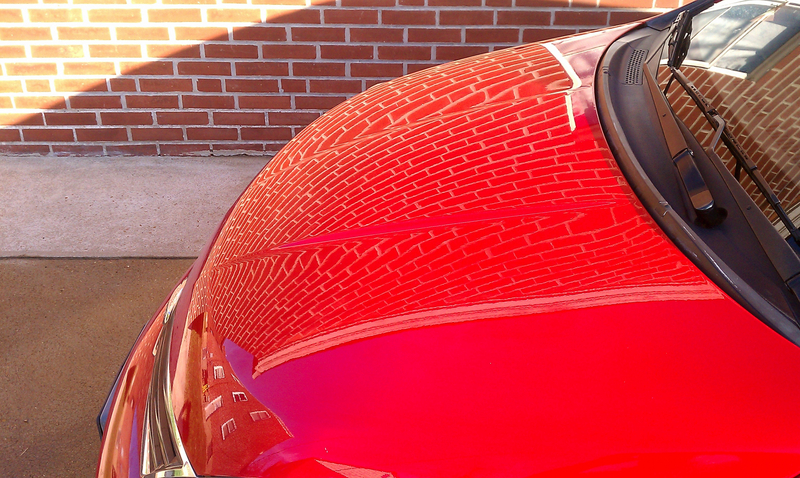 Use after Blackfire poly clay bar and lube, and Blackfire paint sealant for the best shine I've ever seen. See photo and enlarge, esp. at front of hood, can see back of my apartment bldg. like a mirror! Reflection of mortar from brick garage next to car is unreal when enlarged! Car remains outdoors 24/7, and is 8 years old. 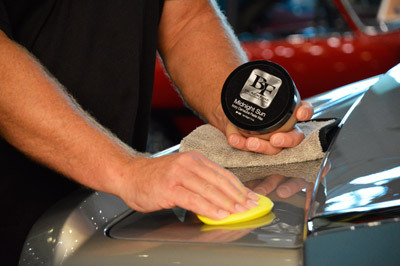 Blackfire is an easy wax to use and goes a long way,you only need to use a little to do the job. I find it gives you a grate shine and makes the paint look like it was just painted. Now for the bad part,you drive the vehicle around the block and its like a magnet.The vehicle looks like you drove it down a dirt roadevery thing sticks to it. I have never had a wax do this, if you are going to show your vehicle at a Concourse its grate. I have a new car. I clayed it and put on the Blackfire gloss enhansing polish then the carnuba wax. The car is "blue pearl" and it doesn't look as i expected. I guess that the deep shine only works on very dark colored cars. The rain beads well and the car is easy to clean. I do expect the wax to last four months, we will see. Applied this over a 8 year old paint job, white paint, and it gave it gloss and depth unlike any product I have ever used. Compared one side vs original wax and it was noticeably brighter more reflective and glossier. I did prep paint with wash/cleaner/clay/detailer before using, and I recommend you do that as well. Gave an old paint deep depth, I was never sure white could even do that. Did not produce the same results on a 911, but I think that the paint was already near that gloss stage, it did make the overall look of the car better, and maybe with more prep it might be even glossier. Seemed to give the car a glow? ProsWonderful finish, Depth, gloss, smooth application, easy to buff, no marring or build up, large jar, great applicator. ConsMay not boost your finish to ultimate if your already mostly glossy/show finish.